I wake up very early (my body still on Central time) so I do more work until the Mexican place next to the Hampton opens up. At 8, I head over for a plate of churizo con huevos (hmmm, pork fat and eggs!). The boys won’t arrive until noon so I kill more time working on a proposal and doing paperwork. Around 11:00 I get a call that Jeff, Rob and Steve have arrived, Brad’s flight is delayed. I head over to meet Rob at Avis where we load all my swag from Wal-mart into the Expedition and return my rental car to Hertz. We pick up Jeff and Steve and head out to the El Cajon airport to pickup the motors Jeff and Steve shipped out. We get to check out the shop of Steve’s competition in the prop business (nice folks) and we transfer the gliders and other assorted gear to the roof of the truck so we can load in the motors in the back. After getting everything loaded, we head back into San Diego, to the North Park area to meet Phil Russman for lunch. The great sushi place I ate at last time was closed at lunch so we settle for Thai next door. After lunch we head back to the airport to pick up Skybrake and then head south for the border. On the way south, we stop off at an ATM for Rob C to get cash and I am thoroughly ridiculed for wanted to stop and buy toilet paper before crossing the border. We then hit I-5 south and are soon in Old Mexico. Once we get south of Rosarito, the coast is fogged in and it gets worse as we drive south. 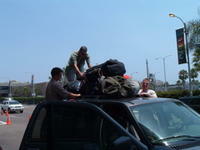 Within an hour we arrive at Baja Brent’s beach house and unload most of the gear and put the motors together. We also find that the house is completely out of toilet paper! Vindication! We then head north to the sand dunes about 10 miles north in hopes soaring twin tuned exhausts, burning nitro. The kid on it was racing up the dunes at around 70 mph. After realizing that he is a pretty good rider (and we won’t get to see any carnage) we head to the liquor store and then to dinner at a local place. After dinner, we engage in some moderate social drinking to the tune of a couple cases of beer and a bottle of rum and them hit the sack.